"Creamy chocolate cookie with coconut and walnuts. No baking, just put in the refrigerator. 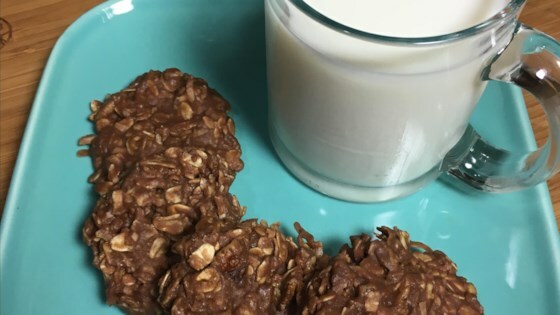 This was my grandmother's personal version of this no-bake cookie. This is much richer and a pure chocolate lover's delight." Combine sugar, milk, and butter in a saucepan. Bring to a boil; simmer until sugar is dissolved, about 2 minutes. Remove from heat; stir in chocolate chips, oats, coconut, and walnuts. Drop spoonfuls of mixture 1 inch apart on the lined baking sheet. Chill until firm, about 1 hour.